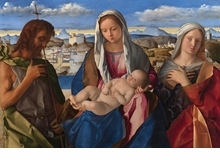 An emblematic master painter of the Quattrocento, Giovanni Bellini remained active beyond that period and into the era now known as the High Renaissance. While his colleagues died or faded from view, Bellini, in the first decades of the 16th century, continued to be creatively vital: indeed, he flourished as never before. The six paintings Bellini made during his final years (1513–16) constitute a distinct group that differs significantly from his previous works in style, support, subject and mood. Their subjects were stipulated by his patrons, but in a period in which he relied more and more on assistants, Bellini’s decision to undertake and personally conceive and execute them points to a special commitment on his part to their creation. The Feast of the Gods at the National Gallery of Art, Washington, DC, and other works that follow it, such as the Woman with a Mirror in Vienna and the Drunkenness of Noah in Bensançon, display a greatly expanded range of subject matter and a new degree of inventiveness. 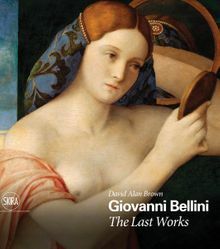 New technical investigations have played a key role in grasping the novelty of Bellini’s last works. Recent scientific investigation at the National Gallery of Art marks a major advance in the technical analysis of works of art. And it literally sheds new light on The Feast of the Gods, allowing us to see more clearly than ever before images or motifs hidden below the paint surface. With an abundance of color plates, this book is the fruit of this research, and provides a deep dive into Bellini’s greatest, final, triumphant phase. Hardcover, 9.5 x 11 in. / 400 pgs / 368 color / 32 bw.